The racially charged protests in Charlottesville this month have sparked a wave of indignation and awareness across the globe regarding the rise of far right populism and white nationalism. 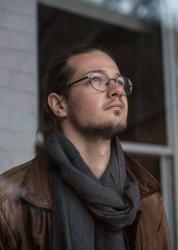 Long confined to operate in the shadows, increasing its presence on the Internet and engaged in a so-called ”meme war” with the left, far right movements are now taking the streets, sometimes in a very theatrical way. Parading in military-like uniforms, armed with automatic assault rifles and burning torches, the recent gatherings in America deliberately draw on an iconography associated with the Ku Klux Klan and other neo-Nazi groups, trying to revive a legacy of hate and racism most people thought belonged to history books. While white supremacy is going mainstream in the U.S., it’s also spreading abroad, inspiring hate groups in other countries, like neighbouring Canada, to organize and raise their voices during public demonstrations. 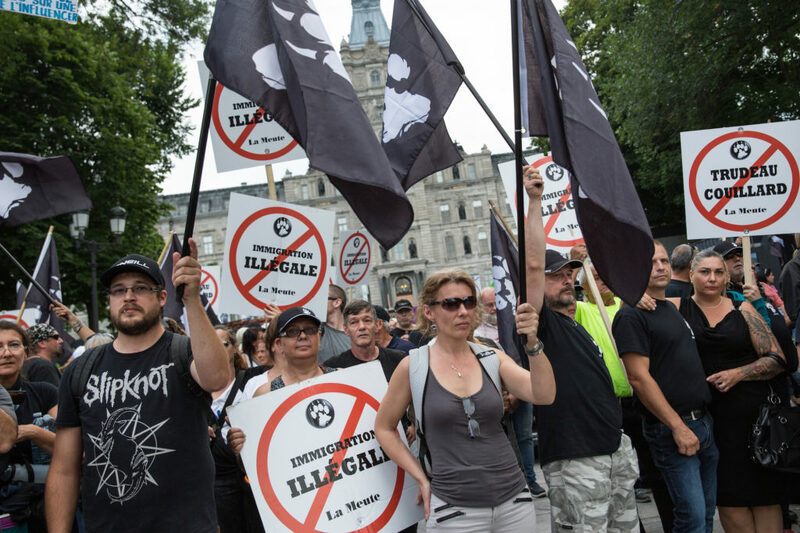 On August 20, the newly-formed anti-immigrant group La Meute called for a big march in Quebec City to protest the federal and provincial political decisions regarding the surge of ”illegal immigration” at the Canadian/American border. For the past few weeks, thousands of Haïtians living in the United States crossed the border on foot hoping to obtain refugee status in Canada. Donald Trump’s decision to put an end to the renewal of their Temporary Protected Status has set a climate of panic within the community, fearing deportation. La Meute (Wolfpack) is described on its website as an organization that protects and defends the laws and values of Quebec against radical pro-Sharia Islam. The group was co-founded in 2015 by Patrick Beaudry and Eric Venne, two former Canadian soldiers who experienced the war in Afghanistan – Venne was sent to serve with the army, while Beaudry was hired as a private contractor. The organization claims to have of over 50,000 members, an unexpected level of support for such a short period of existence. On August 20, members of La Meute gathered in an underground parking lot located beside the National Assembly of Quebec, waving signs and flags that were provided by the organizers. But the protest didn’t happen as planned. By 1:00pm, a group of antiracist and antifascist militants mainly coming from Montreal showed up to shut down the far right protest. Even if they let them stay, police forces pushed back the protesters and tried to create a passage for La Meute’s members who were still joining the rally. A four hour siege ended up unfolding as antifascist militants stayed on the spot to prevent them getting out of the parking lot to march, while another group took to the streets, eventually clashing with anti-riot squads and provocative far right sympathizers. After hours of protest, police forces dispersed the crowd, sending the protesters to their buses on their way back to Montreal. La Meute’s group was finally allowed to get out of the building where they were taking shelter. Some of its members suffered from the heat, feeling sick due to the lack of fresh air and drinkable water, and having no access to a restroom. Determined to hold the protest as planned, the group of roughly 400 persons walked silently for about an hour, well protected by 20 to 30 homemade ”security guards”, waving Patriots and wolf-pawed flags. This demonstration was crucial for La Meute’s future. One thing that was at stake was La Meute’s desire to show how disciplined and respectful of the law they are — trying to break up with the far right label they’ve carried since the beginning — while doing whatever is necessary to prove its legitimacy and seriousness to the public. Addressing the crowd at the end of the march, Patrick Beaudry asked La Meute’s members to spread the word and help the organization grow. While its supporters chanted ”Nous sommes La Meute ! Nous sommes La Meute !” (We are the wolf pack! ), Beaudry announced that there will be more protests to come and that this was only the beginning of a larger, stronger movement. The recent protest follows a July 1 gathering on Roxham road, the most important unofficial point of entry to Canada, in order to confront refugees crossing illegally into the country. 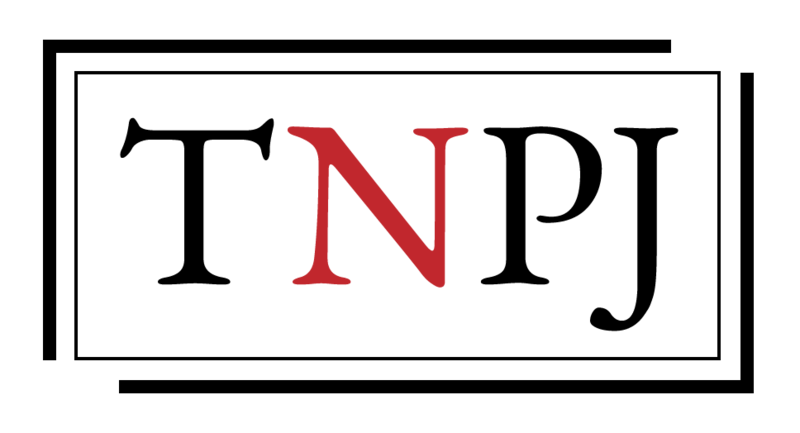 Far right and nationalist movements have been a part of the political spectrum of Canada and the province of Quebec for many years, but their visibility in the public sphere has increased significantly over the past decade. In 2007, following a series of overwhelmingly covered news stories about religious reasonable accommodations, Quebec’s government decided to establish a special commission whose mandate was to travel across the province to collect testimonies to gauge the general population’s views on the place of religion in society. The commission quickly became a platform for the most aberrant xenophobic speeches, mainly directed towards the Muslim community. Broadcasted on public news channels, the Bouchard-Taylor commission’s work initiated a passionate debate opposing two strong visions: one promoting tolerance, dialogue and multiculturalism; and an other depicting Islam as a treat to Quebec’s identity and secular way of life. This debate reached a whole new level in 2013 when governing Parti Québécois proposed a bill to end the reasonable accommodation controversy. The ‘Quebec Charter of Values’ was designed in order to establish legal guidelines that would prevent abusive situations when it comes to the application of religious accommodations. The public’s reaction to this announcement was extremely divided, 43 per cent supporting the bill, while 42 per cent rejected it, according to different polls conducted at that time. Important protests gathering thousands of people took place in the streets of Montreal and Quebec City, sometimes leading to tense situations between pro and anti charter. The bill eventually died as of the 2014 provincial election results when Philippe Couillard’s Liberal party, strongly opposed to the charter, won over Pauline Marois’ Parti Québécois. Even if the controversy has died down since then, the recent displays on the streets of Canada show that anti-immigrant sentiments are alive and well.